The Planet Bar is all about Cape Town cool; champagne, oysters, cocktails and caviar for Cape Town’s style elite as well as the occasional A-list celebrity. 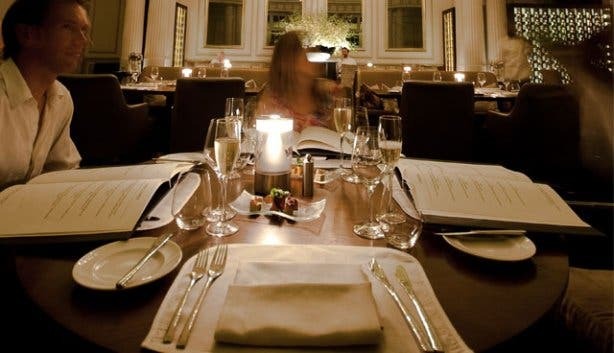 Indeed, the Mount Nelson Hotel is host to one of the most revered bars in Cape Town – and now you can stay for dinner too. 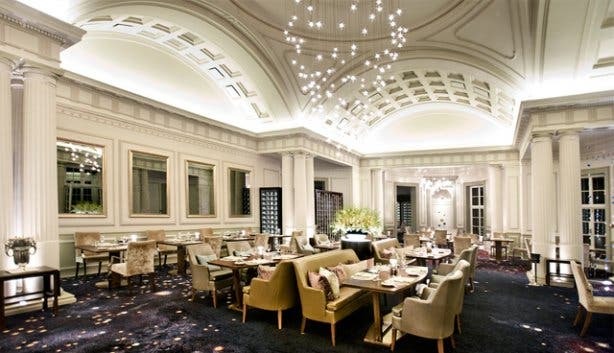 The Cape Colony Restaurant has been overhauled and in its place the Planet Restaurant opened its doors in December 2010. A short walkway between the Planet Bar and the Planet Restaurant means we only have to walk a few lazy steps past elegant strings of crystal glass balls and across the galaxy themed carpet, from our cocktail glasses to our dinner table. 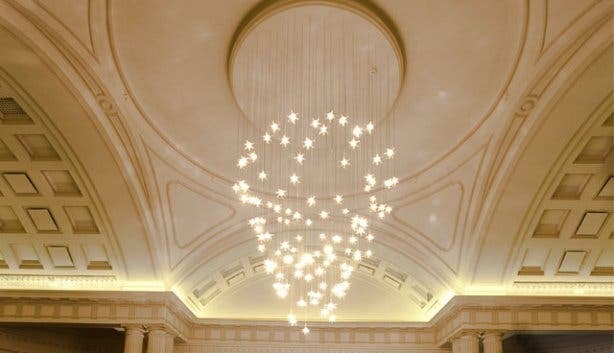 The Planet Restaurant interior was done by DHK Interiors, who adorned the space with zodiac themed mirrors and a graceful star inspired chandelier, whilst a certain section of the restaurant even features ceiling stars. It’s romantic in a trendy way and the ambience is supported by subtle house music in the background. As we sit down a small plate of canapés arrives at our table. Smoked ostrich, salmon wrapped feta cheese and a tiny biltong and smoked lamb crepe. We are also offered a flute of complimentary Genevieve Méthode Cap Classique. It’s a lovely dry Unwooded Chardonnay from the Overberg area. What a feast; and we’re only just getting to the bread. Freshly baked ciabatta, olive bread and country bread are being offered and I pick a small ciabatta which goes down exceptionally well with the rich farm butter. The Mount Nelson has their own bakery, butchery, patisserie; a totally self sufficient unit of culinary delight. 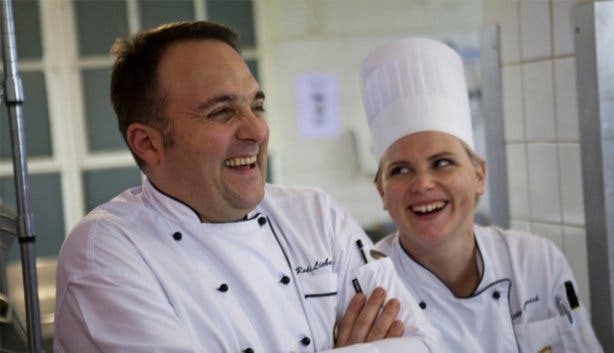 Antonia and I decide to go for the Journey menu, a selection of six tasting courses where Chef Rudi Liebenberg can showcase diverse ways of presenting seasonal ingredients. The first course is a tomato selection, including tomatoes that are extremely hard to find in Cape Town, such as green Spanish tomatoes. It is also interesting to try the tomato sorbet and tomato foam that is included on the plate. 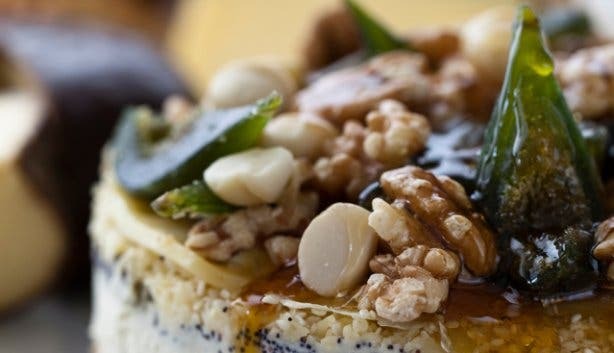 A journey for the taste buds indeed. Sommelier Carl Habel helps us pair a Neil Ellis Sauvignon Blanc with the tomato selection. This minerally white has a nice acidity to it and works especially well in setting off the character of the different types of tomatoes. 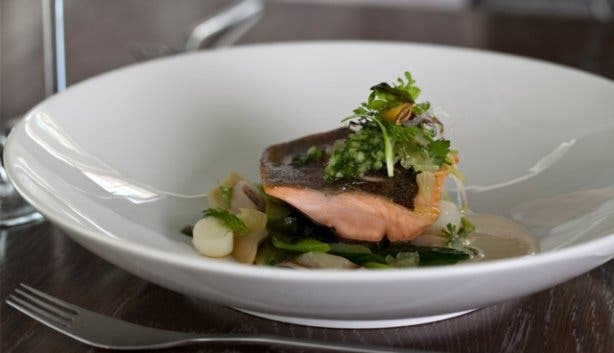 Our next course is salmon trout, also served as bite sized pieces prepared in different ways, tartare, parfait and confit. Carl suggests the Constantia Uitsig Unwooded Chardonnay 2009 which is a very food friendly wine and a perennial favourite. As the third course makes it to our table things become even more of a taste adventure. 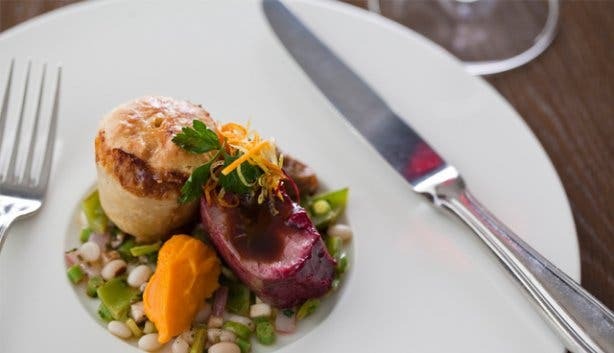 The Slow Cooked Free Range egg served with local cured ham, matured Gouda and Pinotage reduction can also be ordered as a starter from the a la carte menu. The exceptional soft-smooth texture of the egg is owed to the sous vide method of slow cooking the egg for about an hour. 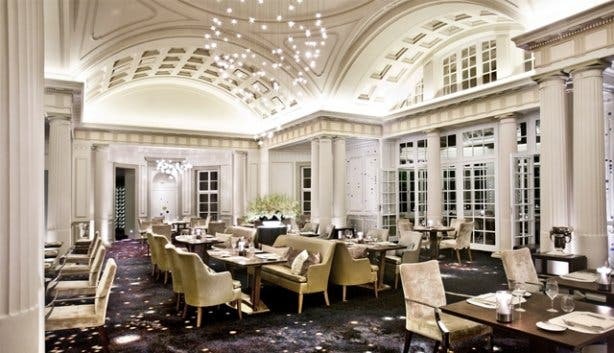 Interestingly enough, while this course started out sounding like a breakfast option, it is quickly voted an all-time fine dining favourite at first bite. Sommelier Carl expertly pairs this dish with the complex and refined Bellingham The Maverick Chenin Blanc, a consistently gorgeous wine. It really is a food and wine journey. Our main course of fillet with exotic mushrooms and potato foam is paired with an incredibly complex Neil Ellis Cabernet Sauvignon. A classic red wine-steak pairing that tops off the meal on a pleasing note. Dessert is served as a medley plate of strawberries in different forms and shapes. 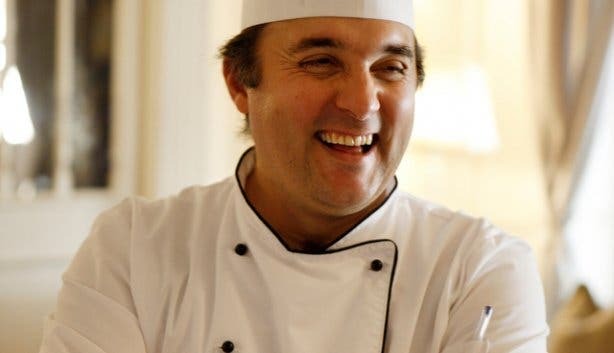 It’s a nice, light way to end and indulgent journey into the culinary skills of Rudi Liebenberg and his team, as well as the wonderful seasonal ingredients that is so carefully sourced by the Mount Nelson. 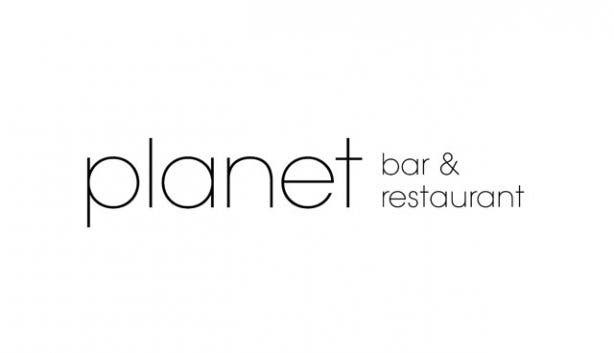 Read more about the Planet Bar at the Mount Nelson Hotel. Or visit the Librisa Spa.